It is hard to find an infant in India without the trademark black dot on the left cheek or a black dot on the left temple. What do these black dots indicate? Well, it is intended to ward off evil eye or nazar or drishti, whatever you prefer to call it. The rationalists laugh at it and the traditionalists have a firm belief in it. Is the evil eye or nazar a myth or reality or a superstition? What is this evil eye or nazar? Evil eye is considered as the negative energy that can cause harm to you. It is believed that the gaze from an evil eye can disturb your energy fields and thus causing harm or discomfort. It is believed that since babies have a weaker energy field, they are more susceptible to evil eye. Rationalists dismiss the concept of evil eye as a superstition. They contend that a human eye is for viewing and does not emit any radiation to cause harm or discomfort to others. The believers or the traditionalists explain the evil eye through auras. All human beings are supposed to have an aura around them called as the subtle body. It is thought to be an energy field arising from our physical and mental health status. When a person who is jealous of you, gazes at you, his negative energy can penetrate your energy field and harm you. For babies, the aura is not strong enough to shield themselves from evil eye. Also read: Naamkaran – How to choose the right name for the baby? What does evil eye or nazar do to babies? Evil eye is supposed to cause loss of appetite or tummy ache or incessant crying in babies. 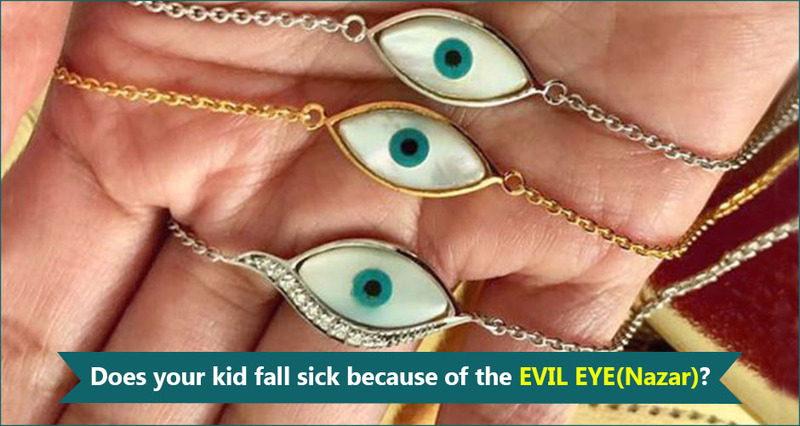 Though many doctors claim that these issues can be due to many medical reasons, many mothers like to take precautions by either preventing the evil eye or removing the evil eye. Well, to believe it or not is purely your personal choice. If as a mother, if you don’t mind following a few old beliefs, there is absolutely nothing wrong in placing a black dot on your baby’s forehead or doing the ritual of removing the evil eye with chilies. But that should not prevent you from NOT taking medical help for your baby when required. How can you ward off the evil eye or nazar? There are many traditional ways to prevent evil eye falling on your babies. Let us see which are popular for preventing evil eye. Keep a black dot about the size of a pea on the left temple of your baby or on the left cheek using kajal. Tie a black thread around the left ankle of your baby. You can even put a small anklet with black beads for both the feet. Never feed your baby in public or in front of others. Always cover the milk bottle of your baby. Tie an amulet around the neck of your baby. Take some rock salt in your fist. Move it around your baby in a circular fashion 3 times in anti-clockwise direction and 3 times in clockwise direction. Throw the salt into water. The dhrishti supposedly goes away as the salt melts. Take rock salt and few red chilies in your fist. Move it around your baby’s head in a circular fashion 3 times in anti-clockwise direction and 3 times in clockwise direction. Throw it on the stove. If your baby is refusing to eat food, do not eat any leftover from its plate. Divide the leftovers into 3 parts on the same plate. Take each part in your fist and move it around your baby in a circular fashion 3 times in anti-clockwise direction and 3 times in clockwise direction. Throw the food to the dogs. Take a ripe lemon and move it around your baby’s entire body in a circular fashion 3 times in anti-clockwise direction and 3 times in clockwise direction. Go outside your house and squash the lemon with your left foot and tear the lemon into 2 pieces and throw one to the left and one to the right. Take vibhuti/bhasma/sacred ash and apply it on your baby’s tummy and neck if it is crying continuously. Light camphor on a plate and move it around your baby in a circular fashion 3 times in anti-clockwise direction and 3 times in clockwise direction. Take the black smoke and put it on your baby’s head, left hand and left leg. If possible, apply a tilak/teeka on the forehead. Dear Mommies, we have only discussed about popular ways to ward off or prevent evil eye for those who believe in it. Belief in such practices in solely your choice and is not forced. However, always remember that no matter what precautions or rituals you do to ward off evil eye, your child may need immediate medical attention in some cases. Performing an evil eye removing ritual does not indicate that you should skip a doctor’s consultation. Trust your judgment as a mother and rush your baby to the doctor if it is crying for too long or has a tummy ache or a prolonged reduced appetite.